If you are using wooden skewers, soak them in cold water. Place chicken breasts between two sheets of plastic wrap on a sturdy surface, and thin them to 1/4 inch or less by banging with the bottom of a heavy sauce pan (cast iron has *so* many uses!). Cut into slices 1.5 inches thick and about 4 or 5 inches long. 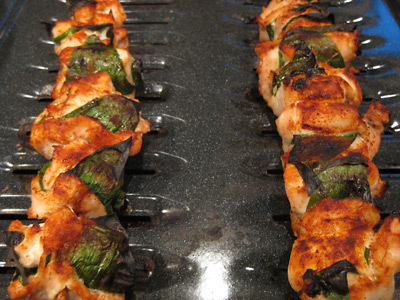 Sprinkle with salt and pepper, then place a ramp green on top, roll it up, and place on the skewer. If you end up with some smaller pieces of chicken, just cut them into squares about the same height/width as your rolls, cut up some ramp greens to about the same size, and alternate chicken and ramp green on the skewer, packing together closely. 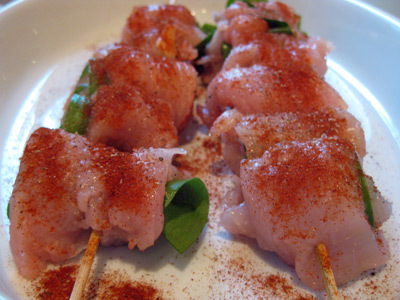 Sprinkle both sides of the skewer with a little more salt, pepper, and a liberal amount of the hot paprika. Flip and do the same for the other side. Let rest for 20 minutes or so. Ideally you will cook these on a hot grill, but in my case my grill is not totally fixed, so I broiled them right up under the heating elements in the oven for just over two minutes a side. Serve by drizzling e.v. olive oil on top, and with a slight sprinkle of coarse sea or kosher salt. The ramp flavor really comes through and it all works together nicely. Don’t forget the olive oil at the end!